You Call. We Haul. You Move. Based out of Philadelphia, Pennsylvania Elvis Dirt Cheap Moving and Storage Company has been servicing the tri-state area and long distant communities for over 15 years. We provide excellent service at competitive pricing. Ask our representatives for the best pricing to suit your needs. You can book a move and view our products online for purchase and speak with a representative for sales and service at one of our facilities. Commercial and Residential storage is available at one of our two locations with amenities such as our state of the art climate control, 24 hour surveillance, flexible hours and a highly trained staff of professionals equipped to handle your service needs. Flexible payment options are available for your convenience. We accept most major credit cards; Visa, Mastercard, American Express and Discover. 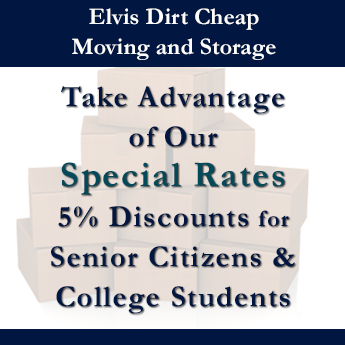 We at Elvis Dirt Cheap Moving and Storage are certain that your moving and storage needs will be of complete satisfaction from start to finish. We take pride in knowing that once you have been serviced by our company you will understand why we believe that you our customer is our most appreciated asset. Contact us to get a pricing quote for our moving services and storage units. We started this business in the Germantown area of Philadelphia, Pennsylvania more than 15 years ago. We have since expanded to the Northern Liberities section of Philadelphia just North of Center City. Our goal was to tie into other aspects of the moving and storage industry by offering a multitude of services to our clients. Beginning with one truck, two men and a dream Elvis Dirt Cheap Moving and Storage has grown into a company capable of assisting you our customer with all of your relocating and storage needs. Let us be your go to company for this transition in your life. Monday -Friday : 8 a.m. - 7 p.m. Call us in Philadelphia, Pennsylvania, toll free at (215) 849-5605 with any inquiries about our moving and storage services.